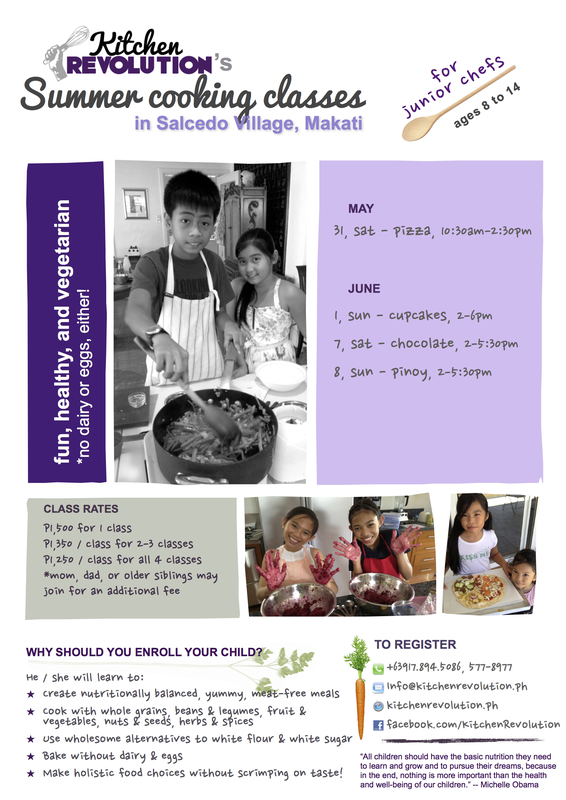 We’re bringing our popular healthy kids’ cooking classes from the Alabang suburbs to Makati! 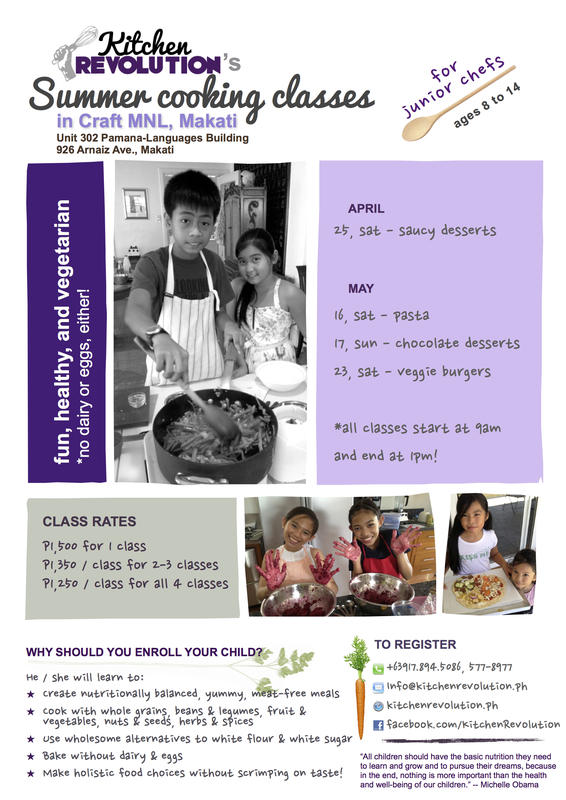 If you want your kids to learn how to chop, prepare and cook vegetables, and eat nutrient-dense meals, then these are the classes for them. There are 4 weeks of classes – Tuesdays cover cooking (savoury food) and Thursdays cover baking (desserts). We will be covering the following themes: Filipino, Japanese, pasta, pizza, cookies, chocolate desserts, cupcakes, and saucy desserts. Classes start on May 10 and end on June 2. Sign up for 1 or sign up for all! Hello hello! 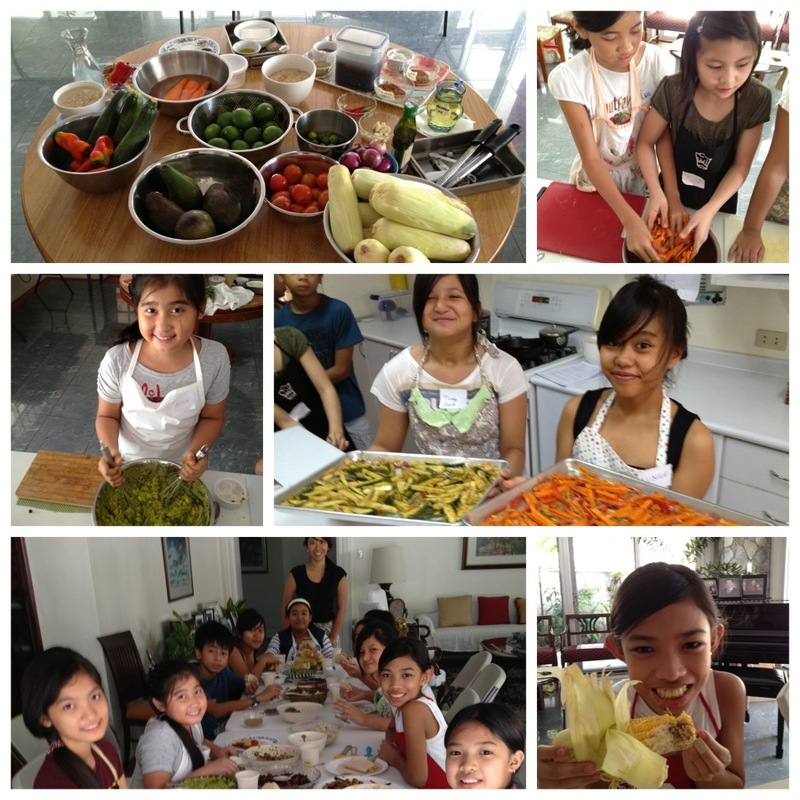 We’ve been getting a LOT of clamors for healthy, vegetarian cooking classes for kids in Makati – after a million years I decided to hold a few right before the school year starts. If you live up north and have been dying to send your kids, nieces, or nephews to my kids’ classes that so far have been conducted in Alabang, now is your chance to do so! 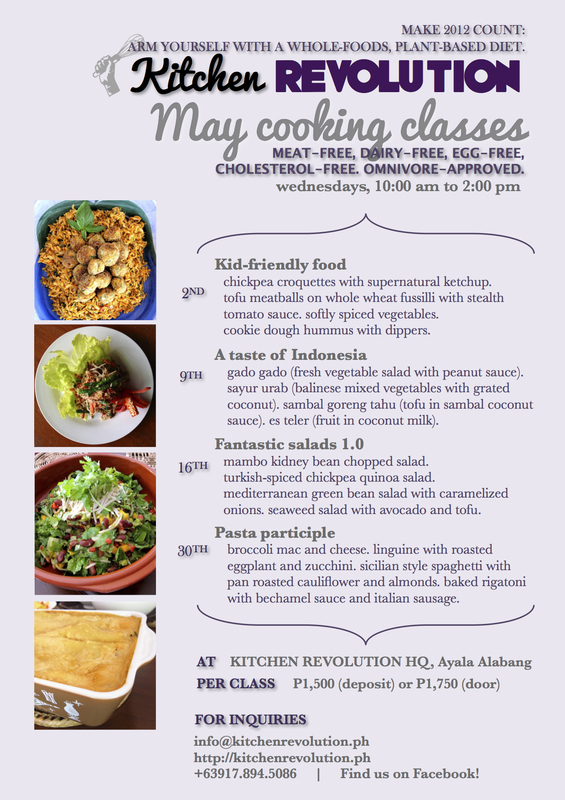 I can only teach 4 Makati kids’ classes so I picked 4 of the most popular classes held in my Alabang kitchen so far. 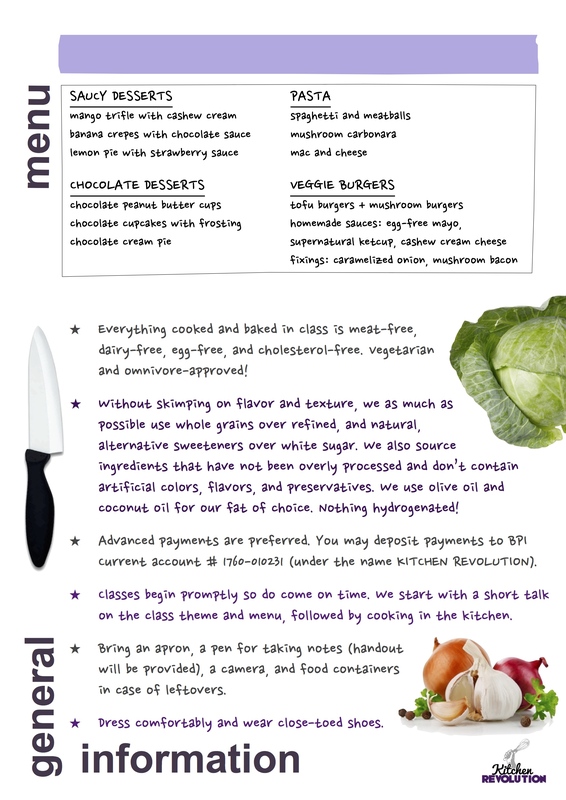 If you want your kids to learn how to chop, prepare and cook vegetables, and eat nutrient-dense meals (this applies to pizza, too! ), then these are the classes for them. Peruse the menu below; sign up for 1 or sign up for all. 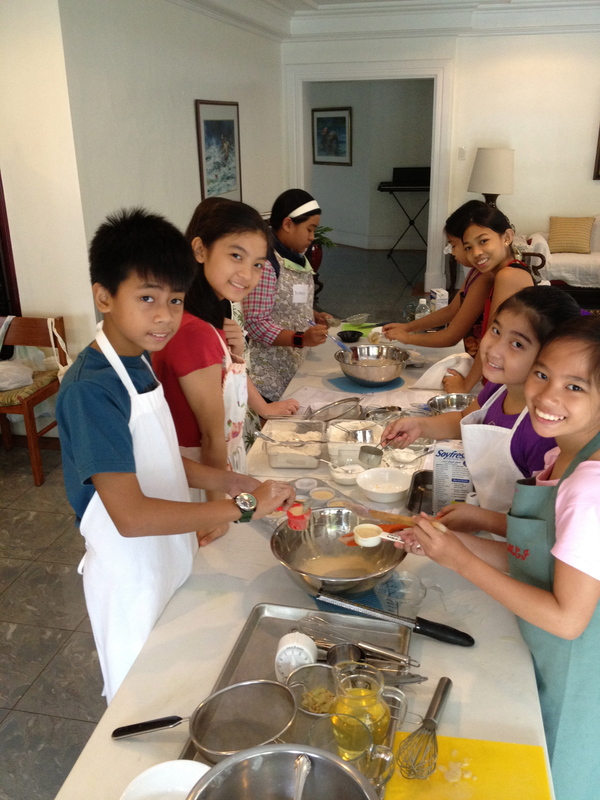 The kids will be making everything from scratch, even the dough for pizza! This past summer’s pizza class drove us a little bit crazy, in a good way. Classes will be held in a private residence in Salcedo Village, Makati (the address is not published on this website) and limited slots are available. To inquire, text 0917-894-5086, call 577-8977 or email info@kitchenrevolution.ph. * As the kids’ classes are quite popular, reservation of slots and pre-payments are encouraged. Check out last year’s cooking classes here (this website), here (Facebook), and here (Facebook again). A few photos of this past summer’s classes in Alabang can be found in this album (Facebook) – starting with this photo. Kiddies having a blast squashing tofu! Vegetarian cooking sure is fun. PS: Please note that I respond better through text and email inquiries more than calls. My landline is a Globe duo number and I personally answer all inquiries. If I’m teaching or R&D’ing in the kitchen, I won’t be able to answer calls. PPS: The age range indicated below is 8 to 14 years; I am able to accommodate 6-7 year olds IF accompanied by a grown-up or yaya. PPPS: Adult classes are still happening in June! Stay tuned. 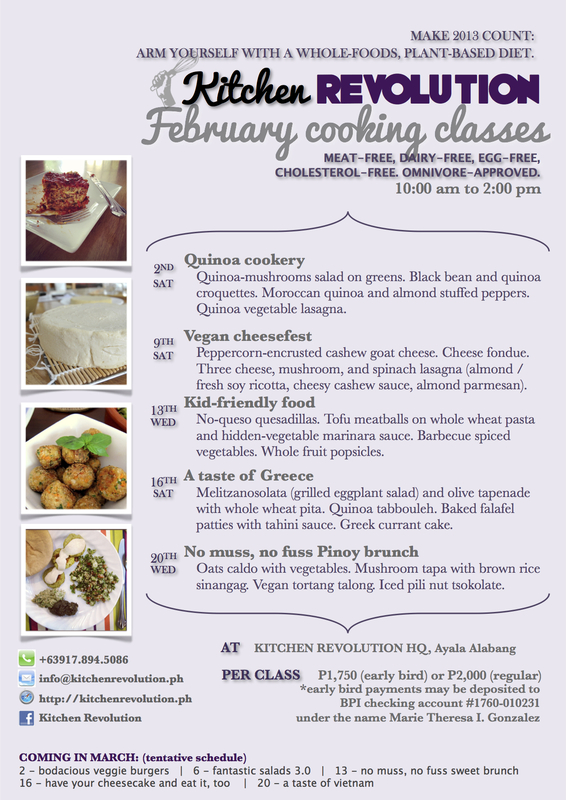 Catch these awesome classes this February! It can be challenging to feed veggies to kids with picky palates; learn a few tricks in KID-FRIENDLY FOOD on Wednesday the 13th. 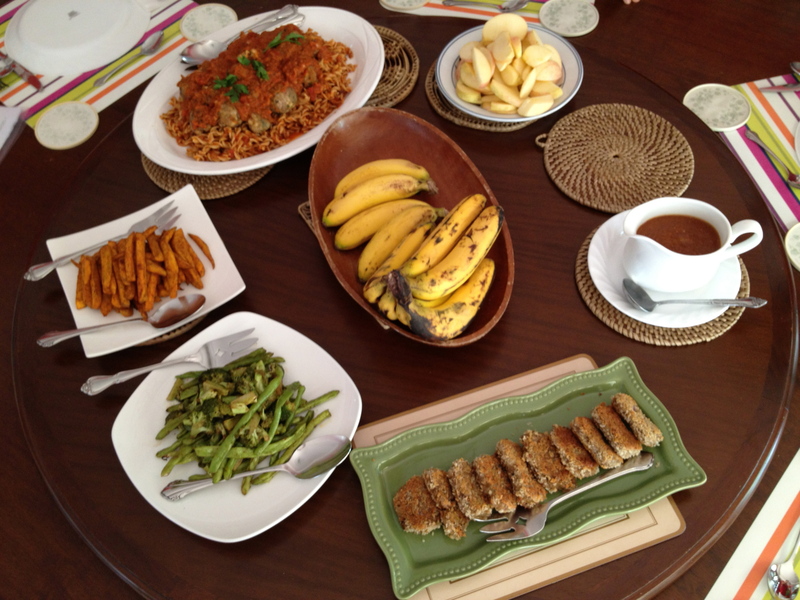 And Filipino breakfast favorites get veganized in NO MUSS, NO FUSS PINOY BRUNCH on Wednesday the 20th. Photos of past classes here. The month of May is shaping up to be quite delicious — come revel in the kitchen chaos! 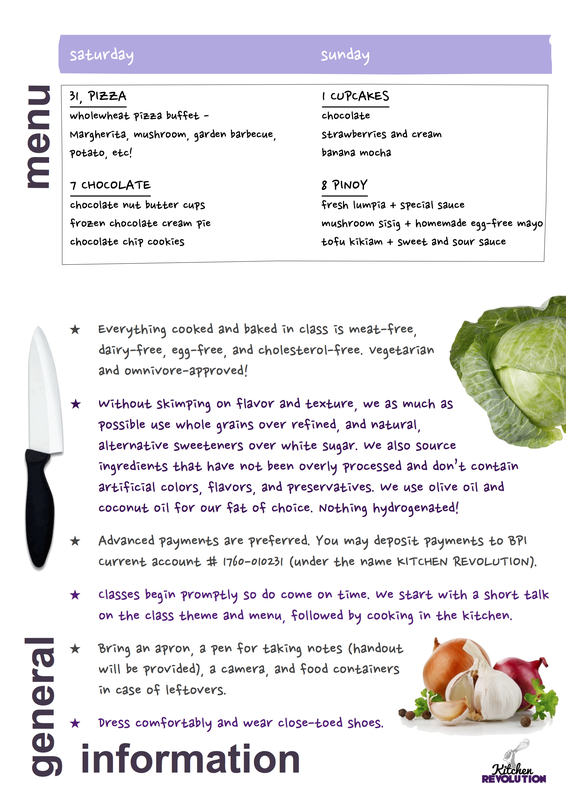 Get ideas for healthful cooking for kids on the 2nd. Take a culinary trip through Indonesia on the 9th. Arm yourself with an arsenal of salads on the 16th. And last but not the least, learn more interesting, less mainstream pasta dishes on the 30th. 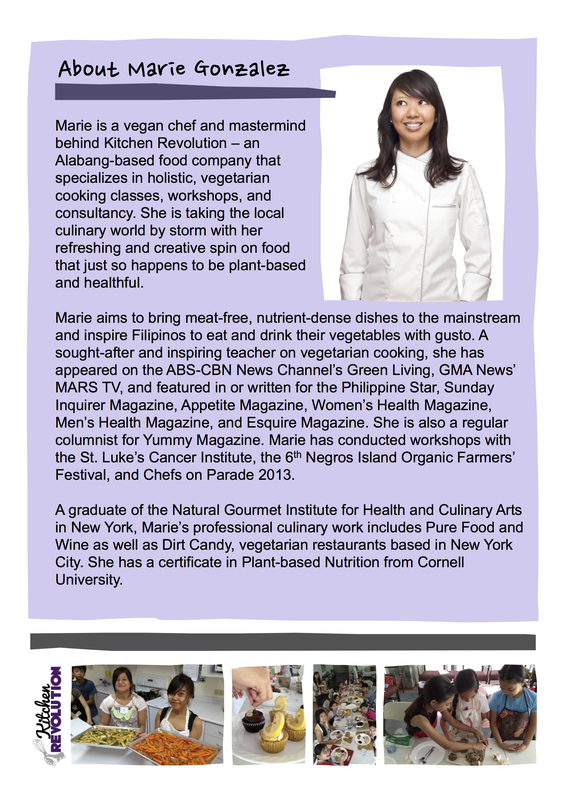 Watch out for 2 classes in Makati (6th and 20th, Sundays), and a cancer fighting cooking workshop in St Luke’s QC (19th, Saturday). All plant-based, all good, all the time.